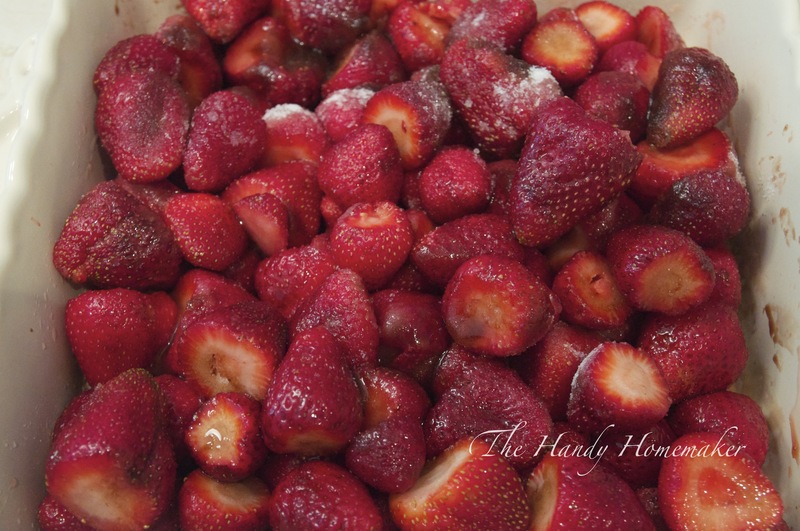 Strawberries bring a flash of memories for me, sweet, warm summers of my youth and the early days of raising my children. Some of my favourite memories are taking long walks with my mom and picking wild strawberries that were growing along those country roads. I Proudly placed my brightly colored tupperware cup on the counter. She would mix up her beloved white cake recipe and would add our small wild strawberries to the batter. She would always I had a very small strawberry garden however, the garden was newly planted and when it did finally produce fruit, it never yielded the amount of berries I desired. This year and almost every summer since, as soon as the U-picks would open. This particular year I had put Chelsea in the infant back carrier and rounded my baskets with sun-kissed red berries. 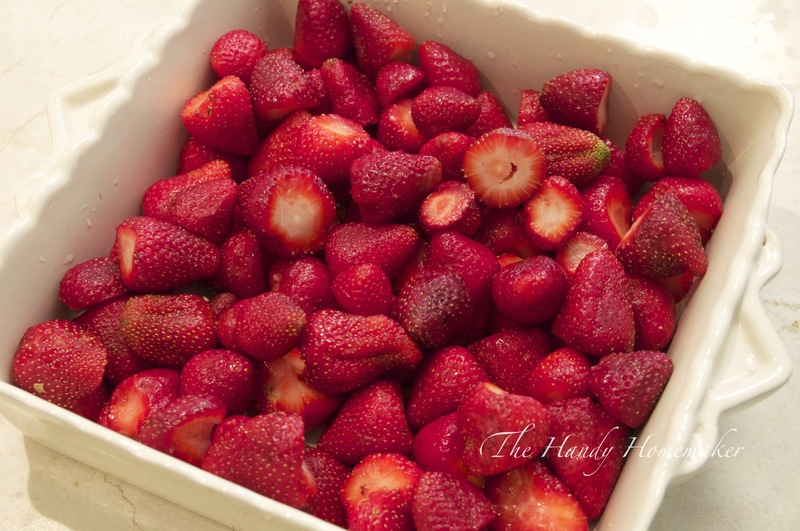 Once home I looked at the amount of strawberries on the kitchen table and immediately thought about taking a nap. That thought quickly disappeared into thin air when Chelsea let me know it was time for her lunch with a shriek. Placing her down for her nap I went back to the kitchen and spent the afternoon and evening making strawberry baby food, strawberry jam, freezer jam, and strawberry shortcake for dessert. In the evening before bed I looked at the jars I had neatly lined up and smiled at the sense of accomplishment. I still get that same feeling today when I am surrounded by boxes of freshly picked local strawberries. 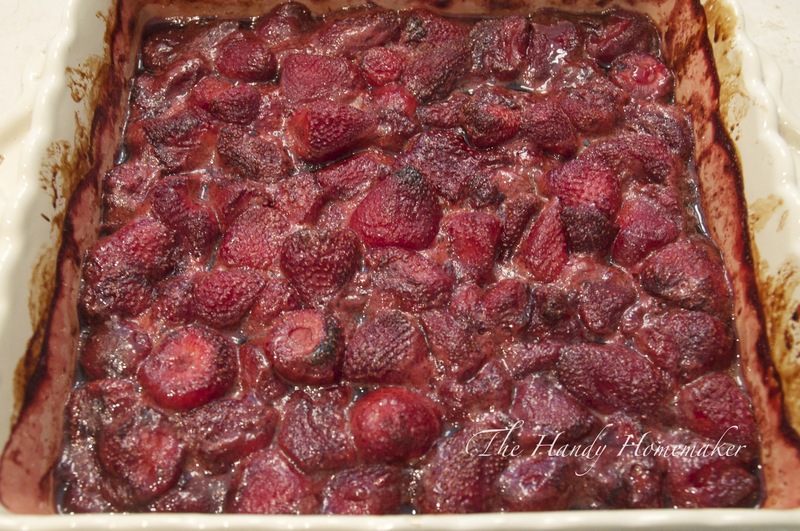 The first time I roasted strawberries was when Chelsea was around 8 months old. 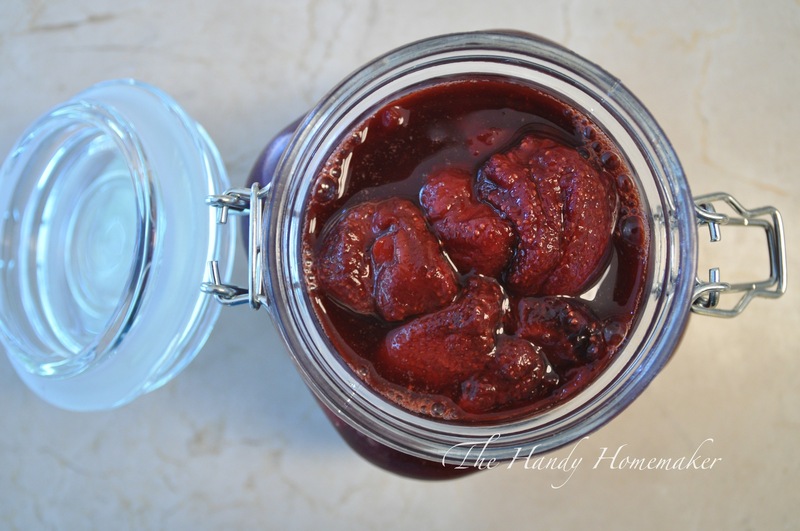 I made homemade baby food as often as I could. Roasting the vegetables and fruit seemed like a better option than boiling to soften and cook the fruit before pureeing. I wanted to keep the flavours and the nutrients in her food not pour all the goodness down the drain. Also my tendency to burn things that were left unattended for a wee little minute (or 5) was high at that point in my homemaker days. As a young mom I quickly learned I could multi-task between my children, meals, and housework by using the oven. 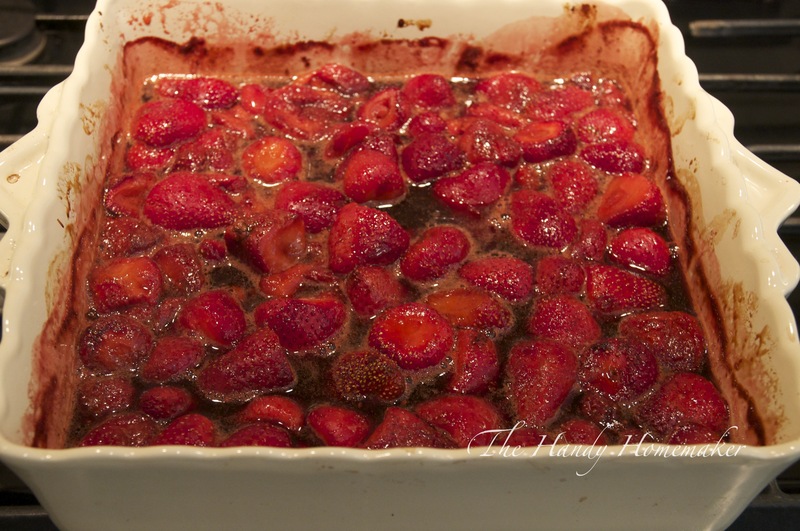 Roast these strawberries and then serve over a wedge of NY style cheesecake. Last minute dinner guests coming over and no time for baking? Head to your local grocery store and buy a plain frozen cheesecake and serve with the roasted strawberries, a small drizzle of a rich balsamic vinegar, and a fresh strawberry on the side. Now dust forehead with flour 😉 Usually when I make crepes or waffles for breakfast I chop up fresh strawberries with a little sugar or honey and serve chilled with whipped cream. However, these style berries are delicious served as a dessert with vanilla whipped cream or vanilla ice cream on top of crepes or a dessert size waffle. 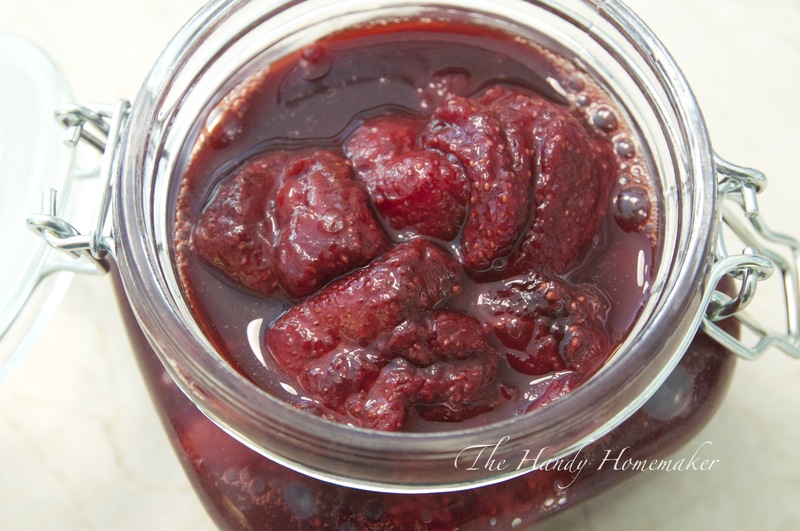 This strawberry balsamic glaze is delicious in my Homemade Strawberry Gelato recipe. 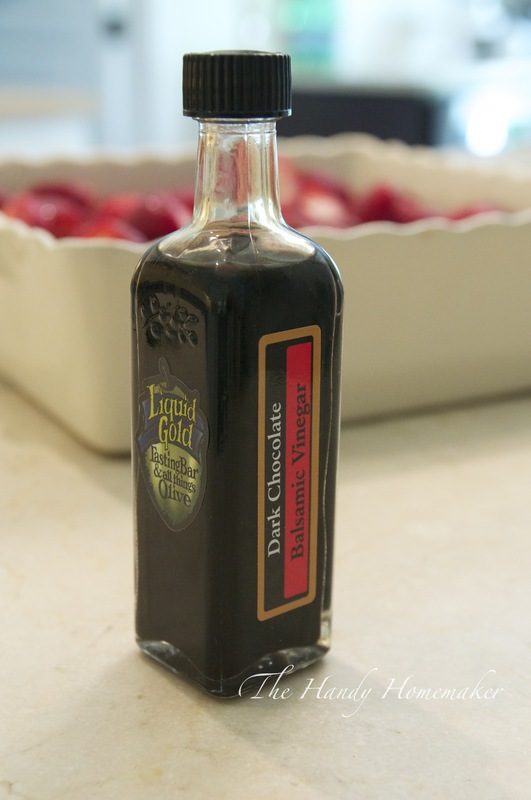 I chose this Dark Chocolate Balsalmic vinegar that is available locally. It’s rich velvety-sweet taste comes from the three different chocolates it’s made with. Use the best balsamic vinegar you have available to you especially if you drizzle a little over the finished dessert you are making. Wash, dry and hull the strawberries. Place into a baking dish. 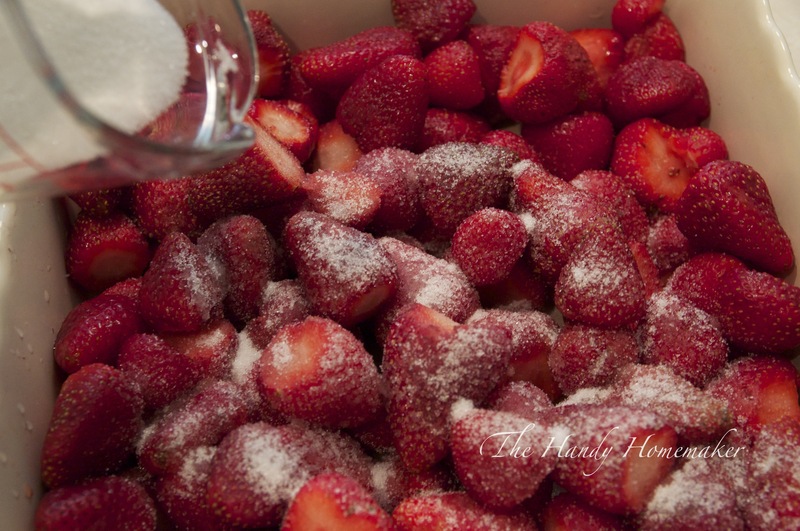 Measure the sugar and sprinkle evenly over the berries. 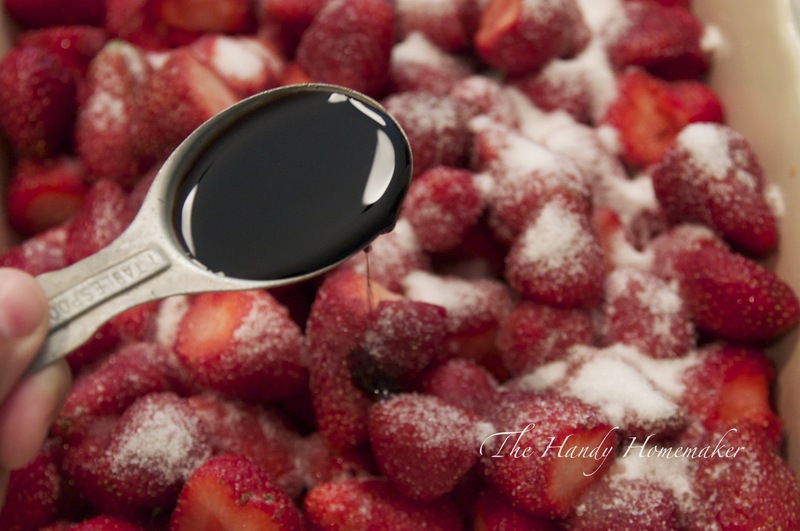 Stir the berries to evenly distribute the sugar and balsamic vinegar. Place in a preheated 350° oven and set time for 50 minutes. 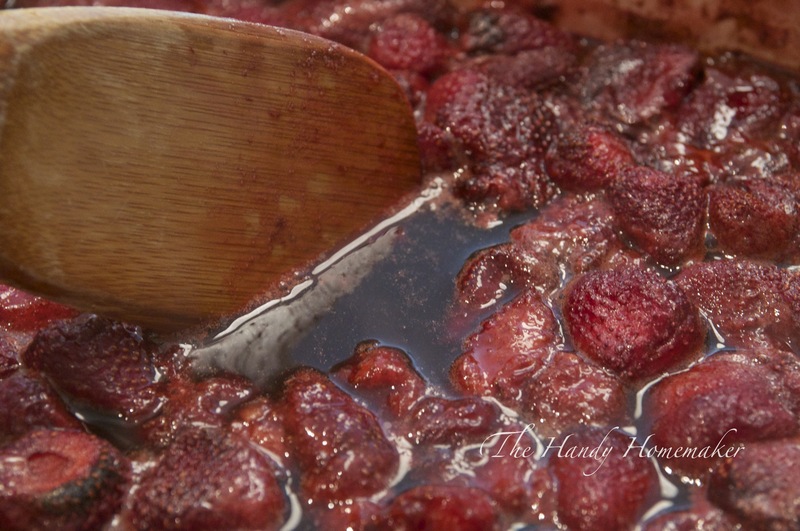 Every 10 minutes stir the berries gently to prevent the strawberries from scorching on the top. Remove from the oven and let cool on before using. The syrup will be runny but will thicken up once cooled. Store in a jar with a cover in the refrigerator. Quickly reheat in a sauce pan to serve warmed over a dessert.